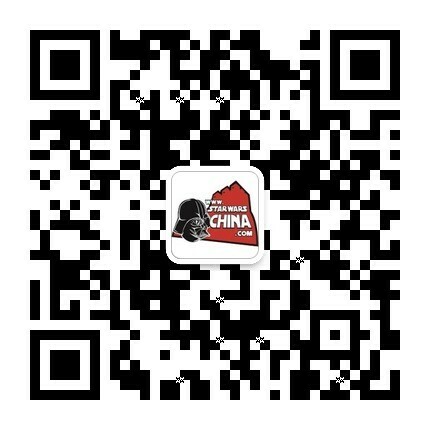 ﻿﻿ 共和国攻击炮艇（Republic attack gunship） - Databank - 星球大战中文网 Star Wars China - Powered by Discuz! Rugged, combat-equipped repulsorcraft, Republic attack gunships rained down blistering barrages of laser and rocket retribution against the droid forces of the Separatists. Each winged gunship was covered in weapons, offering air-to-ground and air-to-air support as well as serving as an infantry transport. The front of the gunship features hunchback-style cockpit bubbles, wherein the gunship pilot and copilot / gunner sit in single file. Chin-mounted on the craft are a pair of laser cannon turrets. On the gunship's dorsal surface are its primary armaments, two massive rocket launchers fed by a rear-mounted missile belts. The vessel's splayed wings have a pair of automated bubble-turrets, with composite-beam laser weaponry. A second pair of bubble-turret cannons extends on articulated arms from the troop cabin, and are gunner-operated by clone troopers encased within the armored spheres. Air-to-air rockets are slung on the ventral surface of each wing. Rounding out the gunship's armaments is a single tail-cannon that provides covering fire for troops and small vehicles leaving the gunship. A larger variant of the gunship is specially designed to airdrop heavy cargo, such as the Republic's AT-TE combat walkers. Developed by Rothana Heavy Engineering, a subsidiary of Kuat Drive Yards, the Republic gunship is designated an LAAT/i craft (Low-Altitude Assault Transport/infantry). Despite their heavy weapons, the gunships are still swift and maneuverable enough to avoid all but the most advanced mobile artillery. Gunships excel at troop deployment and extraction, using their weaponry to clear a landing zone (LZ) long enough for crack troops to board or disembark. The two primary armaments are mass-driver cannons capable of propelling projectiles to hypersonic velocities. Once airborne, a rocket's internal guidance systems take over, allowing it to home in on designated targets. The gunship's belt-fed rocket launchers allow for specialized ordnance payloads for specific mission requirements. Though standard explosive yields are common, gunships have been fitted with corrosive antimatter shower warheads, radiation burst missles and EMP rockets. The troop cabin is open to the air, allowing infantry to fire their rifles at targets, further supplementing the gunship's arsenal. The passenger section is equipped with an IM-6 battlefield medical droid and other survival gear. In the case of catastrophic damage, the entire cockpit section can eject from the rest of the craft. The larger, cargo-carrying variant of the Republic attack gunship is designated an LAAT/c. 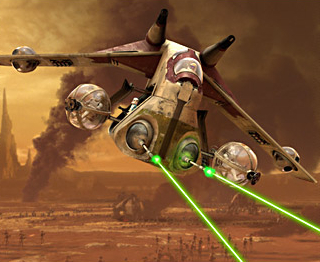 The Republic attack gunship was known in production as the "Jedi attack helicopter," clearly indicating its design roots. In much the same way that Director George Lucas used archival footage of World War II dogfights as inspiration for the starfighter battles in the original Star Wars, he turned to news footage of helicopter-troop deployment to help envision the clone trooper's gunships. The hunchback cockpit configuration was influenced by the the Russian Hind helicopter design.